Nick has strong connections with all three Bay towns. He was born in Paignton, worked in Brixham & lives in Torquay! His close family, including his (unpaid) special political advisor all live in Galmpton & his nephews & niece attended local schools. After Montpellier School, Paignton, he attended King’s College Taunton & then studied Philosophy, Politics & Economics at Exeter College, Oxford. He also holds a postgraduate certificate in education from the College of St Mark & St John, Plymouth. He had a brief teaching career in Plymouth, Hackney & Torquay as well as working in his family’s estate agency business before his election as Mayor in 2005. 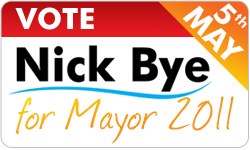 Nick was first elected to Torbay Council in 2000 & served as the “old style” civic Mayor in 2003/04, when he got to know so many of the Bay’s voluntary & community organisations, as well as raising a substantial sum of money for the Herald Express Heart Appeal. Away from politics he enjoys theatre & has supported numerous productions over the years, including an appearance as Mr Humphries in the TOADs summer 2005 production of “Are You Being Served?” …. which provided a neat slogan for his previous election campaign. He is currently the President of Paignton Pantomime Productions, although Town Hall duties preclude his taking part on stage. Nick enjoys living in the Bay, taking advantage of the stunning natural environment for coastal walks, also the occasional “dip”, including a 1 mile swim for the Devon Air Ambulance last September. More regularly, he undertakes morning jogs through Ilsham Valley & by Meadfoot beach in order to blow the cobwebs away & stay fit. But he is no stranger to the night time economy & enjoys a busy social life which includes calling into many of the bay’s diverse pubs, clubs & eating establishments. When time allows, he enjoys reading, most types of music & travel, especially to South Africa where he has many friends & has had the privilege of meeting prominent political figures & gaining first hand knowledge of the immense challenges faced there. Last year he spent time visiting other seaside towns in the UK, including Scarborough & Bournemouth, in order to learn a little more about regeneration in places which face similar problems to Torbay. But he always likes coming home to the Bay & considers the last five years, serving as Torbay’s first directly elected Mayor as enormously fulfilling, as well as occasionally frustrating. Through it all he has remained optimistic & approachable, in part because he is a real “people person” & has greatly enjoyed meeting all kinds of people who he might otherwise not have encountered. He is well & truly “up” for another four years.